Donna Reish, author of numerous writing and language arts books as well as Character Ink blog, Raising Kids With Character parenting seminar, and Language Lady blog, answers readers’ questions about efficiency in the kitchen. In this follow-up to Five Tips for Kitchen Efficiency, Donna shares more kitchen efficiency tips—especially meal planning for busy families. 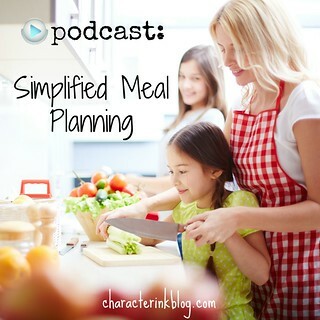 In this podcast episode, Simplified Meal Planning, Donna describes two “thinking” processes for deciding what to have for meals: (1) Basing meal lists on meats or main ingredients and keeping a running list of the things you make and (2) Keeping staples for the most common meals on hand. Donna shares her master entrée list in the accompanying handout to help get your creative juices flowing. She also focuses on making quick decisions and not getting bogged down mentally or time-wise with indecisiveness. Click here to download the printable handout. Subscribe to our Wondering Wednesday podcasts in iTunes. Click here to see our previous podcasts!